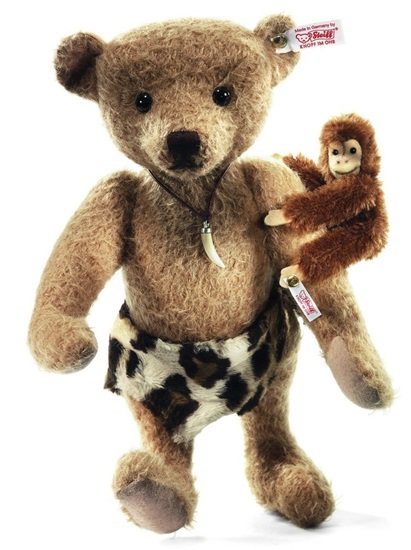 New in 2013 from Steiff's Spring Collection, we are pleased to share "Johnny and Jocko", a 13-inch Mohair teddy bear with a friend, Jocko. "Johnny and Jocko are both 5-way jointed and are surface washable. Johnny is made from felted cafe au lait mohair and features delicately hand-airbrushed details on his chest, paw pads, ears, and muzzle. He is wearing a leopard-pattern lined loincloth-and a big game tooth on a cord around his neck. Johnny's friend the ape, Jocko, is based on the classic minature 12-centimeter Jocko design highlighted by time consuming airbrushed painting on the face, feet, and hands. They are a limited edition of 1500 worldwide.